Polyacrylamide is a versatile chemical treatment agent in oilfield. In oil extraction it could be used as a flooding agent, water shutoff regulator, drilling fluid regulator, fracturing fluid additives, especially in cementing, completion and workover. The oil industry is the largest area of polyacrylamide applications. Polyacrylamide (PAM) is not only a high-performance flocculants, but also because of the high viscosity of aqueous solution, but also a very good thickener. Due to its thickening, flocculation and regulation of rheological properties it can be used as a drilling fluid, fracturing fluid, and polymer flooding in the exploitation of oil extraction. The key to the application is the combination of conditions and requirements, Reasonable design and selection of its composition structure, such as molecular morphology, molecular weight, ion degree and so on. 1.Polyacrylamide for drilling mud additives. Drilling fluid in oil extraction works as drilling mud performance adjuster. PAM role is to adjust the rheology of drilling fluid, carrying cuttings, lubrication drill bit, favorable drilling. In addition, can also greatly reduce the car accident, reduce equipment wear, And can prevent the occurrence of well leakage and collapse, so that the rules of the well diameter in this area is often used in part of the hydrolysis of polyacrylamide, which is derived from the hydrolysis of PAM or polyacrylonitrile derived oil extraction polyacrylamide in cementing, completion And workover in the workplace. Oil extraction special polyacrylamide can be used as mud retarder, mud drag reducing agent, mud filter loss agent, mud plugging agent to reduce the difficulty of operation, to avoid accidents; in the completion and workover can be used as a filter, tackifier and clay stabilizer. 2.Polyacrylamide for oil flooding. In the tertiary oil recovery (EOR) with enhanced oil recovery, polyacrylamide can be used to adjust the flowability of injected water, increase the viscosity of the driving fluid, improve the efficiency of water flooding, reduce the permeability of water in the ground, To move forward. The former surfactant and auxiliary agent with ultra-low interfacial tension microemulsion into the injection wells, and then injected into the polyacrylamide solution, and finally water injection. The water is pushed forward by the plunger flow, displacing the residual oil dispersed in the pores and increasing the recovery of the crude oil. Polymer flooding technology plays an important role in improving oil recovery, and the role of polymer is to adjust the rheology of injected water, increase the viscosity of the driving fluid, improve the efficiency of water flooding and reduce the water infiltration in the formation Rate, so that water and oil can move forward smoothly. 3.Polyacrylamide for water shutoff regulator: In the oil field production process, due to stratospheric heterogeneity, often produce flooding problems, the need for water shutoff, its essence is to change the water in the formation of the seepage state To achieve the purpose of reducing oil production, maintaining formation energy and improving oil field final recovery. Polyacrylamide as a water shutoff agent has a selectivity to the osmotic ability of oil and water, reducing the permeability of the oil by more than 10% and reducing the permeability to water by more than 90%. 4.Polyacrylamide for drilling fluid additives. It could be modulated into a solution its role is to adjust the rheology of drilling fluid, carrying cuttings, oil drill, reduce fluid loss and so on. The low proportion of drilling mud prepared by polyacrylamide solution can reduce the pressure and blockage of oil and gas layers, easily find the oil and gas layer, and are favorable for drilling and drilling. The drilling speed is 19% higher than that of conventional mud and about 45% higher than that of conventional drilling , In addition, can also greatly reduce the car accident, to reduce equipment wear and tear, and to prevent the occurrence of well leakage and collapse. 5.Polyacrylamide for fracturing fluid additives. Fracturing process is an important stimulation measure for the development of dense layer in oilfield. Polyacrylamide is widely used because of its high viscosity, low friction resistance, good ability of sand suspension, small filtration loss, good viscosity stability, low residue, wide supply and easy preparation and low cost. 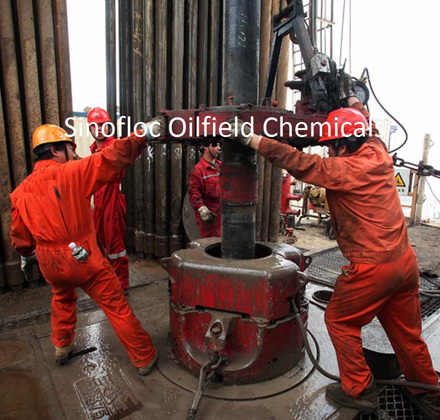 Fracturing process is an important stimulation measures for the development of dense layer in the oil field, and its role is to open the channel of the rock, so that the oil flow through the methylene polyacrylamide cross-linked fracturing fluid, due to high viscosity, low friction, Good suspension capacity and ease of preparation and low cost advantages are widely used.